Boston and the surrounding areas are becoming more and more bike friendly each year. Not only are more people riding bikes, but the local governments including the cities of Boston and Cambridge are doing what they can to make things safer and more enjoyable for bike riders and for the rest of the community. There are a lot of reasons that cities like Boston are interested in making things better for bike riders. One of the reasons is that young professionals who they are trying to get to move back to urban areas are one of the main groups of people who ride bikes. This brings us to another reason why bike riding is good for the community. It is good for the environment as it reduces one’s carbon footprint and also reduces the amount of noise and congestion on the roads.While many complain that bicycles slow down traffic, this is not always the case and doesn’t have to be the case if the city is willing to install proper bike lanes and provide drivers with the information they need to keep traffic flowing and keep everyone safe. However, as our Boston bike crash lawyers have seen, while bikes can be an enjoyable way to commute while getting some much-needed exercise, they can also be dangerous, especially when drivers of cars and trucks do not use the necessary care too keep them safe and secure. One of the reasons bike accidents often result in serious injury or even death, is because when a car weighing more than a metric ton hits a bike rider, the bike rider has very little protection from this type of crash. Yes it is true that all riders need to wear helmets, but helmets can only do so much, especially when the accident involves being hit by a motor vehicle. To get an idea how much damage a single car can do a bike, let’s look at recent article from the Boston Herald. In this accident, a driver from Quincy was arrested for leaving the scene of motor vehicle accident involving property damage and negligent operation of a motor vehicle. Authorities have alleged defendant was speeding on Boylston Street in downtown Boston and red several red traffic signals. After running the red traffic signals, defendant allegedly crashed into a Hubway bike station. These are the stations where tourists and locals can rent bikes and return them to any station in the area. These bikes can be used for a commute to or from work or just as a means for getting around the city. While the bikes themselves are big and bulky and not exactly built for speed, they are a very convenient alternative to having your own bike and having to lock it up everywhere you go and worry about having a bike that costs hundreds or thousands of dollars stolen. In the case of tourists, most do not travel with their bicycles. When the car allegedly crashed into the bike station, all of the bikes on the racks were mangled and the station itself was destroyed. The company cordoned off the area and sent a crew out to clean up all of the debris. If a single car can destroy all of these bikes and station hardware, it is hard to imagine how any bike rider would be able to walk away from being hit by the same car. When officers finally located the defendant, they said there was no indication he had been drinking, but he was injured. His car was also heavily damaged. Authorities placed defendant under arrest and then transported him to Tufts Medical Center for treatment of the injuries he sustained when he allegedly crashed his car into all of these bicycles. In this case, the bike station must be fully removed (what is left of it) and replaced with an entirely new bike station. The company that operates the bike share program in Boston is the same company that manages systems in Washington, DC and many other cities around the nation. A spokesperson for the company said that while there are accidents in which cars or trucks crash into the bikes in Boston or elsewhere, normally they can usually make some repairs. It is however, very “infrequent” for an entire bike share stations to get demolished as was the case here. You might be wondering if the driver of the car in a Boston bike crash will try to say it is not his or her fault that the bike rider was so badly injured or killed because they assumed the risk by getting on a vehicle that offered so little protection. First of all, it should be noted that when Massachusetts went to a comparative negligent system via Section 85 of Chapter 231 of the Massachusetts General Laws (MGL), the legislature did away with the defense of assumption of risk. The statute specifically says that the defense of assumption of risk is hereby abolished. This is because assumption of risk was considered part of the common law system of contributory negligence. Under that system that is only still used a small handful of states, if the plaintiff was in any negligent in causing an accident, then he or she could not recover. This means that in the case of a bike accident, if the car operator was 99 percent negligent in causing the accident, but the bike rider was just one percent negligent, the bike rider could not recover. This was a harsh result in many cases so they allowed for the use of the last clear chance doctrine. 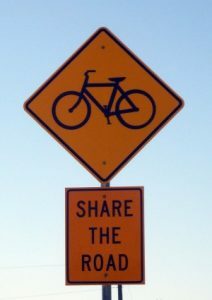 Under this doctrine, if the bike rider could show that the driver of the vehicle could have avoided the accident, because he or she had the last clear chance to avoid it, then the liability would shift back to the driver and the fact that bike rider may have contributed to the negligence would be canceled out. As discussed above, this was a very complex system that was often unforgiving and produced results were not considered fair and were not in line with good public policy. For this reason, the vast majority of states rewrote the negligence laws to shift to a comparative negligence system as we have in Massachusetts. Under this system, if both parties were negligent, as long as the plaintiff is not more negligent then defendant, plaintiff could still recover. In other words, if the plaintiff was 15 percent negligent in causing the bike crash and the defendant was 85 percent liable, the plaintiff would still recover, but his or her damages would be reduced by 15 percent.